WHY Do I Dislike AOTC So Much? Why do I dislike the movie so much? I can’t even remember. There are obvious reasons but I felt like there had to be something else that really did not sit well with me for it to grow and evolve over time to a point that I rarely watch the movie. I loved The Phantom Menace. I still do. It always surprises and disappoints me when people talk about how much they loathe the movie and how people want to cut it out of the viewing order entirely as they think it unnecessary to Anakin’s storyline. TPM changed my life. It helped me become a stronger person, more self-assured and less likely to be affected by what others thought of me. I love Qui-Gon Jinn and thought he was the most exemplary Jedi. The movie came out at just the right time in my life to shape the rest of my existence – it turned me into an obsessed Star Wars fan. I wrote a letter to George Lucas asking him how he was going to connect the dots between the Prequels and the Original Trilogy (I remember having a specific question on if mouse droids would be part of the later Prequel movies…I had my priorities) and though he didn’t return my letter – the fan club did send me a copy of the Star Wars Insider. I still have that copy and it’s so beat up because I read it so many times. Through Insider, I found out about something called Star Wars Celebration – the huge convention just for Star Wars fans where the actors, actresses, authors and more show up along with so much Star Wars cosplay – that I convinced my dad to take me to Celebration II for my birthday. We drove all the way from Massachusetts to Indiana in one day. While at Celebration II, I got to sit in on many panels and the lines were not half as long as they are now! I only had to stay in line to see Hayden Christensen for 2.5 hours (unheard of nowadays). Not only did I see Christensen, I also got to see Anthony Daniels, Daniel Logan, Temuera Morrison…all these panels where we were the first to see some new AOTC footage. I loved everything I saw! Jango Fett was so cool. We got to see almost the entire Zam Wesell chase scene through Coruscant. Keep in mind – this was pre-YouTube and streaming so it was a big deal to see these scenes before other people. It was like you were let in on a Star Wars secret that everyone else had to wait an entire month to see. I was insanely excited for the movie came out. Since I couldn’t drive and my parents were not about to go to a midnight showing, I remember having to see it opening day and that was such a travesty. Yet, I went in with such excitement, and I remember leaving disappointed. Over the next week at school, so many people were talking about how it was WAY better than TPM and I was on the fence. Why did I not have the same love for AOTC that I did for TPM? Everyone else was feeling it, why wasn’t I? There isn’t good chemistry between Portman and Christensen. The storyline is not straightforward. The acting can be hard to watch. The humor is non-existent or too forced, other than some horrible puns by Threepio. There are scenes that are uncomfortable to watch because they are so bad like the droid factory scene, the picnic scene, the first half of the gladiator scene until the Jedi show up, etc. Count Dooku is the worst nemesis to pick after Darth Maul – he doesn’t incite any fear and frankly is a downright bore. There is no real emotional connection or stakes in the characters. At the end of it all, I do not want to show this movie to friends. It is not Star Wars to me. In fact, it’s this awkward chapter that does not excite my imagination and it does not leave me wanting to know more about the universe – which is essentially how I rate/rank how good the Star Wars movie is. But while all this is interesting, it does not really get to the core of why I dislike AOTC so much. This is what I have spent the last month thinking about. There are many reasons, but like a psychiatrist digging into a patient’s past, where does it all come from? The answer surprised me and is somewhat two-fold. The reason I dislike AOTC to the point that I do is because of Hayden Christensen. I believe my original reason for disliking AOTC at age 15, by acknowledging the horrible script, is heightened by Hayden Christensen’s bad acting. I have never thought about this before but when I started thinking about the bad script, I realized that though there are awkward lines, Hayden seems to be the faulty screw. Now – I know that this is a VERY obvious point and that many people have criticized his acting before – but I was always steadfastly loyal to him. I continuously blamed it on the script and bad dialogue. I would say, “No one can act well with a script like that!” and I defended him over and over again. But now I realize that I was in denial and that the problem at the core of the movie lies with Christensen. The first scene that we have with Obi-Wan and Anakin going up the elevator to see Padmé and the conversation between them two is very forced. It’s not that funny, though as I watched it closer, Ewan McGregor isn’t the problem. It’s only when Christensen responds and they have to seem like they’re having a conversation between close friends that it starts becoming painful. This seems to be the case with all their scenes together. There are very few scenes between them both that seem to flow naturally. The same is reflected when Hayden Christensen acts with Natalie Portman. While people bemoan the love scenes and how horrible they are (which I entirely agree), when I watch them with a critical eye, I see that it’s not Portman who is the problem. In fact, she plays her part quite effortlessly. She looks at Anakin disdainfully when needed, flirts with him appropriately, and struggles against their love in a believable way. But when Christensen says Anakin’s lines, I don’t buy it. I want to roll my eyes. And someone in the theater shouted out, “We’re all suffering here!” I laughed with others in the theater but also felt a little shocked that someone was belittling my revered Star Wars with such casualness. But I still hear that line in my head every time I see that scene and now, years later, I completely and whole-heartedly agree with whoever shouted that out. Hayden Christensen is the weak link in this movie. Yes, the script writing is bad, but most of the actors and actresses in the film are still able to work with it. They give it their all and I enjoy watching their scenes. But Christensen destroys the movie and as much as it pains me to realize this – I think this is the main reason I dislike AOTC. While I believe Christensen is the reason this movie unravels, the other reasons I listed are also glaring problems. In fact, many of the scenes can be cut or changed or shortened to make it more enjoyable. The droid factory scene could have been left out. The gladiator scene on Geonosis could have been shortened. Threepio’s puns were cringe-worthy, along with some of Obi-Wan’s jokes. I feel like out of all the Star Wars movies, I have no emotional connection or stakes tied to any of the characters. I don’t feel really strongly one way or another about how or where they end up. I don’t even feel like there is a big stake for the galaxy. Most of the time with Star Wars movies, I feel like the small sliver we see has large consequences for the galaxy at large. This is especially true in the OT, but with AOTC, it’s all disconnected and the only glimpse we see is this stealthy meeting on Geonosis between the Separatists. Just one, tiny scene that if you’re not old enough to understand the consequences – mostly goes over your head. Count Dooku as the main sith enemy was a poor choice. All other antagonist’s in Star Wars had been scary and intimidating. After TPM presented us with Maul, I remember wondering how they were going to top that and get an even scarier sith. I mean, we knew Vader, the Emperor and Darth Maul at that point and those villains had been worthy of making me a little frightened. And then AOTC rolls up with…Count Dooku? Ugh. Really? You “kill” off Darth Maul but keep Dooku alive at the end of AOTC? Despite my intense dislike for AOTC, due to Christensen’s acting, poor scriptwriting, and other points, there are moments in this movie I can appreciate. It is not all hatred. I love Obi-Wan Kenobi’s story line. It’s the only Star Wars movie where there is a legitimate mystery that we, the audience, are trying to figure out along with Obi-Wan. We go down this chase of finding out who a bounty hunter is, only to find legions of clone troopers that was made for the Republic. I only came to appreciate this recently – when I was watching AOTC again as part of my pseudo-machete theory viewing prior to The Last Jedi. One of my favorite species in the Star Wars universe are the Geonosians. I think they are a stroke of genius and have fascinated me for a long time. The music of AOTC is amazing. From Jango Fett’s theme to Across the Stars, I find the soundtrack to be a beautiful composition that shows the versatility of John Williams. It’s so different from TPM, which was only three years prior, and even more different from what we heard in the Original Trilogy. There are good moments in AOTC, but now I’m wondering if they had picked a different actor, would I enjoy it more? I think Christensen does a much better job in Revenge of the Sith with his acting, than in AOTC. I’m wondering if he excels at acting in shorter scenes with numerous different characters than when having to play consistently off other (much better) actors. I’m surprised at my acknowledgement of Christensen’s poor acting sixteen years after seeing AOTC for the first time in theaters. I feel like I’ve been in denial because admitting that I think he’s the weak link therefore admits that Lucas is flawed in his choices…which is something I also struggle to accept. Though multiple people have talked to me about Christensen’s bad acting, I have always used the excuse of poor scriptwriting but now I have to realize that I need to call a spade a spade. If you think I’m too harsh, or you enjoy AOTC a lot, please go over and check out My Comic Relief’s post on why AOTC is one of the best Star Wars movies! Next postFan Art Friday! What…? I find your assessment perfectly reasonable and fair. More importantly, I don’t find anything about it out of the norm or controversial. A lot of people identify Christensen’s acting and chemistry with the other actors as a major problem in AOTC, so to add your two cents on the matter is acceptable. Besides, like you said, you don’t hate everything about the film and genuinely love some aspects of it. It is hardly a zero sum game, either love it or hate it. In fact, I find your nuanced approach here, where you carefully decipher your feelings, to be a welcome and refreshing reminder that it is possible to truly like something and identify faults as well. In fact, I am far more skeptical of people who ONLY lavish praise or disdain without any ability, or even a mere willingness, to offer any modicum of nuance or different perspective (especially when Star Wars is involved). Haha, well….part of the challenge was that Michael and I had to also acknowledge while we liked or disliked the film. So that was my effort at the end and honestly – after my viewing this past fall in prep for TLJ, I did enjoy Obi-Wan’s storyline! But overall, I still can’t stand the movie. I rarely watch it. I think what was interesting for me was how much I have defended Christensen for years and deflected his poor acting to problems with the script instead. But I *know* so many people can’t stand his acting. I have known this for so long but it’s a weird realization when you give in and realize, “okay, everyone else has been right this whole time,” hahahaha. But the thing is… I really liked the movie Shattered Glass that he starred in. So I think because I thought his acting was pretty good in that, I blamed everything else in AOTC for his bad acting. But nope. A lot of it is just him. I’m not sure I have seen any other movie he has been in other than Jumper…which I did not care for. I will check out Shattered Glass. The least I can do is give the guy a shot to prove himself to me in some fashion. Let me know when you see it! Most people find it quite good. Even though I’m hear to champion AOTC, I have to say this is a solid piece. I mean, you’re wrong because ATTACK OF THE CLONES IS THE BEST OF THE PREQUEL TRILOGY. But other than that, I liked it ;). Excuse me while I go hurl. When I did the piece on loving this quote you left a comment to the effect of, “You’re going to regret this post in ten years.” I STILL laugh about that line when it crosses my mind. In the nearly 300 posts I’ve done, that’s still one of the best comments I’ve ever seen :). Hahaha. Lol remember that post… It was valentine’s day right? Well I really dislike valentine’s day and I really dislike aotc so it was probably this weird combination of seething resentment coming out of me at that time. And I saw the post and was dumbfounded. I thought it was a joke post while reading it. It took a few takes to realize you were serious and that’s where that comment came from. Hahaha, A LOT of people thought it was a joke post. People thought it was a joke post too when I wrote to champion Mallatobuck as one of my favorite female characters in Star Wars. What can I say? I guess I have ridiculous opinions sometimes :). And whatever forces (no pun intended) led to the comment, they produced WordPress brilliance and it will always hang in my hallowed hall of favorite comments. Oh hey, also, apparently today is my 6 year anniversary on WordPress so I subconsciously chose a cool date to post this! Aaaaaahhh! How exciting! Well Happy Blogiversary and/or Happy Blog Birthday (depending on how you like to celebrate). I agree with the Hayden analysis, in the theatre he would have been called a "coathanger" (in theatre joke meaning wooden) but I have seen him act much better in other stuff, plus he acts better than me. AOTC was like a smokescreen where stuff behind the scenes was taking place (orchestrated by Palpatine) and so not everything could be shown as to blow the secrecy for the audience. We get the Obi-Wan investigation on Kamino as just a tantalising (and entertaining) part of the tapestry that the lead up to the Clone Wars was. But we also spot the holo-projection of the Death Star plans etc in the possession of Dooku. The positioning of the characters and events are more akin to a chess match and at the risk of paraphrasing Mr Spock, "it may not be thrilling, but it is…..fascinating!" Now onto a nice round dozen years on WordPress? Well done. Hi there! Not sure how I missed this. Thanks for the blogversary wishes too! It’s an interesting film, but I think it wasn’t done well. And Christensen is mainly to blame for that because when he’s out of the picture, I find Obi-Wan’s story line to be quite intriguing. I thought he got a lot better in ROTS so that’s probably also why I like the movie more. No problem and you deserve praise, I always enjoy your posts you put a lot of effort in them. Yeah I’ve seen the jealousy theories of Obi-Wan and Padme! I’m not sure I’ve always bought that. I look at it more of Anakin’s need to control Padme because of his fear of losing her and his dreams. So I don’t think he really was jealous of Obi-Wan, I’ve always thought he needed to control and the less he was able to control, the more he channeled the dark side to feel more in power. Oh, also, that story about the fireside scene made me laugh out loud. Oh interesting! I enjoy ROTS and think it’s quite well done and I think Hayden Christensen’s acting is way better. I haven’t heard of many people liking it less than I and II so you have a fresh viewpoint! I can’t stand Rogue One but I know a lot of people who like it so to each their own! I think it’s refreshing and it makes the fan base a lot more interesting. how would you feel if Disney rebooted the Star Wars saga and while keeping the core story intact, made not so insignificant changes? I probably wouldn’t like it! It’s an interesting idea though. Despite my extreme dislike of AOTC, I still think nobody should touch original George Lucas work. First of all, great post in that it reads like criticism of a Star Wars movie from someone who loves Star Wars movies. That’s a lot different than a lot of the online criticism of the prequels from original trilogy fans who seem to refuse to like anything about the prequels and want to criticize anyone who would. This is one original trilogy fan (I was 11 in 1977 and Star Wars rocked my world) who enjoys all the prequels just fine. Are any of them as good as the old ones? Nope. Are they still Star Wars to me? You bet. 1) Great George Lucas world-building with fantastic new environments and creatures in every corner of the frame (something all the prequels excel at, and the sequel trilogy is lacking in). 3) The “moodiness” of the entire Obi-Wan mystery subplot. 4) Getting to watch every gadget get used on the Fett suit. 5) The entire return to Tatooine, with special shout out to the digital acting work on Watto. The subtly of that animation is incredible. 6) Yes the droid factory fight. It was Lucas learning from Phantom Menace’s pacing mistakes. That was almost supposed to be another talking scene and instead the movie hits the gas for some mindless action. Oh, and R2 saves the day, which never gets old for me. 7) The entire arena scene and massive Jedi, clones, battle droid shoot out. Just the kind of scene that Lucas could never pull off with 1980’s technology and exactly the kind of thing old fans like me waited 20 years to finally get to see. Thanks, George! 8) Digital Yoda fighting Dooku. This was as good an audience-pleasing moment as any of the prequels ever had. And if you were at that 2002 Indianapolis Celebration (the only one I ever went to, and I also drove from MA to Indy in one day) you’ll remember the crowd going bananas when we saw the first shot of Yoda levitating his little saber off his belt. Good times. Now, I’m pretty sure you’ve noticed there’s no mention of Hayden Christensen on that list. He does have one or two good moments (mostly the Tatooine stuff), but, yes, much of his performance can be cringe-worthy. But is that really his fault? I can’t think of any actor (particularly one as young as he was) who could deliver lines like “I’ve always hated sand…” or “If you’re suffering as much as I am….” and make it sound like something that a person would actually say. Not to mention the 50 times he has to say “M’lady” in the movie. I mean, really, that’s a lot of heavy lifting for a young actor getting his big break. Ewan McGregor is generally regarded as the saving grace of these movies, but even he’s asked to deliver some clunkers (watch him trying to keep a straight face when he says “This weapon is your life”), and even poor Frank Oz had to spit out “Around the survivors a perimeter create”. Everyone had their work cut out for them in this one. God bless Ian McDiarmid, because there isn’t a scene that guy has in any of the movies where he ain’t making a meal out of what he’s given. I think Hayden – and to a much lesser extent Ewan and Natalie’s – performance suffers from the rushed writing of Lucas. Not only did he famously procrastinate the longest in delivering the script, but by having Anakin start off as a little boy in Phantom Menace it crowed the story-telling time of both Episode 2 and 3 that made the relationship building feel more rushed and allowed for little nuance. Word was that on Revenge of the Sith all of the actors insisted on more rehearsal time and I think this shows in some improved performances. I’m thinking of the scene on Padme’s patio after Anakin wakes up in the middle of the night, etc. You can even see Christensen pushing back on Lucas’ choice of weird hairstyles in one of the behind-the-scenes documentaries. He likely felt like he had no right to question George’s choices the first time around, but was maybe more empowered the second time around after seeing the results on screen. Hello! I love your comment and welcome to my blog. 🙂 I hope you come by more often to give me your insights. There are a lot of things about AOTC which are good – and I like your list. I made my own here a few years ago which I didn’t link to: https://starwarsanon.wordpress.com/2015/12/03/10-reasons-i-like-attack-of-the-clones/ I love that you like the PT despite being raised on the OT. I find that’s rare in the Star Wars fanbase and I wish there were more like you! I heard that Christensen got acting lessons between II and III but not sure if that’s true. Maybe you’re right on the more rehearsals because it felt a lot less stale and forced in III than II. I also liked him in Shattered Glass and thought he was excellent. I’m dying to know where you lived in MA?? I’m still here. 🙂 MA born and raised and staying, apparently. Celebration II was great. I liked it when they were smaller (though they were still huge) and the lines weren’t horrific. The last Celebration I went to was right before TFA and that was insane…I heard the last one in Orlando was even worse. Your 10 reasons for liking AOTC are great ones, with a lot of cross-over with mine. The Mace Windu “This party’s over” moment is really telling in that it’s a good example of Lucas listening to fan criticism of Phantom Menace and trying to answer it. No action for Mace in Phantom Menace? Fixed. Too much Jar Jar in Phantom Menace? Fixed. More action and less talk? Check. Back on Hayden for a bit, I do think he’s specifically good in the meadow scene (I mean before he body-surfs a space cow) when he’s teasing Padme about the “virtues” of a dictatorship. He’s kidding her, right? Or is he? The closest those two ever come to real flirting. Boy Lawrence Kasdan did we miss you on this one! 1) The meadow scene is moved to occur BEFORE the kiss on the lake (and maybe cut out all that space cow body-surfing). 2) The kiss at the lake happens, but you lose the moment where Padme breaks off the kiss. This occurred to me when I saw the IMAX version of AOTC back in 2002 which had 20 minutes cut out of it and it made the film BETTER. They lost the meadow scene entirely and cut away from the kiss before Padme breaks it off and it plays totally differently. Of course, the main flaw of the film is still the dialogue writing – and it’s pretty hard to edit your way out of that. 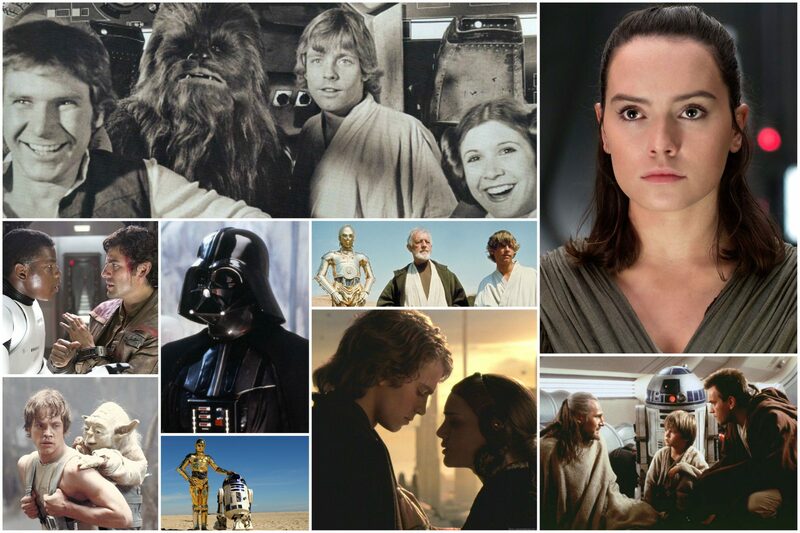 It’s the story structure of The Phantom Menace that really hinders the other two films. For a trilogy that was supposed to be about the romance of Anakin and Padme and Obi-Wan training Anakin/losing him to the dark side it’s amazing that you get an entire first film with no Anakin-Padme romance and no Obi-Wan training Anakin. That leaves a lot for two movies to make up for in too little time. But yes, I am an original trilogy generation guy who loves way more about the prequels than I don’t. If you can get around Lucas’ clunky writing there’s a LOT to like. Lucas’ furtive imagination is positively unleashed in the prequels, and George has more creativity in his little pinky than most directors will EVER have. I go on and off with the meadow scene. On the one hand, you get to see a glimpse of future Darth Vader and, like you said, is he joking? He plays that well. On the other hand, I think the chemistry is still too forced, but not from Natalie. I think she’s doing her best. Hayden just falls flat. Your rearrangement of scenes – verrrry interesting. I saw it in IMAX but don’t remember those changes. I like that idea though, of moving the meadow scene to earlier. It actually makes a lot more sense in life-terms. Most of us have had our first kiss with someone we have the hots for, after a round of flirting like that. I love TPM because I think it sets up the galaxy pre-Empire in a needed way. But on the flip side, Lucas did no real world building with ANH and threw the audience into the galaxy without knowing what was going on, and it worked out wonderfully. I appreciate TPM however for that reason. I think it’s a fascinating contrast. AND – we can’t forget how much I adore Qui-Gon so a movie without him would be sad now that I know him. Great post- and I had just as much fun reading the comments also! Christensen truly is the weakest link in this movie, and I too feel guilty admitting it. The “romance” was so cringe worthy. I was not sold on them as a couple, and part of it was because in TPM he was a child while Portman was a young woman. It was jarring to have them linked a few years later.